One of the first vocal groups to emphasis choreography, the Cadillacs were a mi-50's marvel to behold. One of the leading R&B vocal groups on Vee Jay, the El Dorados had a relatively short career with their first lineup, during which they scored a massive crossover hit, 1955's "At My Front Door" (number 17 on the pop charts and number one R&B, where it remained for 18 weeks). They managed only one other charting record -- 1956's "I'll Be Forever Loving You" -- before their initial breakup in 1959. Subsequent lineups and name changes (and alterations) brought no further success, but they continued performing well into the '80s. much and thought they showed so much promise, that he became their manager. for naming your group after a popular car model hit, and since they couldn't call themselves the Cadillacs, the settled for Cadillacs' luxurious two-door model, the El Dorado, for inspiration. The El Dorados came to the attention of local Chicago WWCA disc jockey Al Benson, who witnessed first-hand how their gorgeous blend of harmonies and talent made for an exciting new group that he could support. They had already won first prize at a local talent show at the Club De Lisa. Benson arranged for the group to audition at a contest hosted by Vee Jay Records at the Park City Skating Rink. Amateur groups were challenged to compete against Vee Jay's Spaniels. The El Dorados rose to the challenge, winning the contest and a recording contract with the label. third week of September 1955, Vee Jay released the group's "At My Front Door," which stormed the Billboard R&B charts on September 24th and the Top 100 on October 15th. The song featured Al Duricati's pounding drum rhythm and a rousing sax solo. The so-called "baby talk" pre-finale by Moses Jr. made the record soar even further, and the lyrics about that "crazy little mama" became as legendary as the Annie saga. By the end of the year it had climbed to number 17 on the pop charts and number one R&B, where it remained for 18 weeks. (Pat Boone later did a cover version that charted at number seven pop). measure up to their prior hit status. Their next single, "Tears on My Pillow" (a different song from Little Anthony and the Imperials' hit record), was the last by all of the original El Dorados; soon after its release, the group and Pirkle Moses Jr. separated over a disagreement on new management. Moses Jr. soon joined another Vee Jay act, the Kool Gents, who had been left without a singer when their frontman, Dee Clark, departed for a solo career. John McCall (tenor), Douglas Brown (second tenor), Teddy Long (second tenor and baritone), and Johnny Carter (bass) of the Kool Gents joined with Moses Jr., to become the New El Dorados. They released two singles in 1958 for Vee Jay, but when neither sold, they eventually left Vee Jay in a money dispute and subsequently disbanded altogether. connected with a former NBA basketball star Don Barksdale, who had formed his Rhythm Record Company in Oakland, CA. The group changed monikers again, this time calling themselves the Tempos, but the group faltered again, and returned to Chicago, splitting up in 1961.
single for Torrid Records. Pirkle Moses Jr. then quit for almost a decade but returned with yet another El Dorados-lineup with tenor Norman Palm (from the Pastels on United), second tenor Billy Henderson, George Prayer (baritone), and Anthony Charles (bass). Around 1985 Henderson left and Anthony Charles passed away. Eugene Huff (of Carter's El Dorados) and Larry Johnson (Moroccos) took their places and the group recorded a ballad for Delano Records in 1987. In effect, that last El Dorados recording group contained members formerly in four Chicago-area groups: the Palms, the Moroccos, the Kool Gents, and the El Dorados. 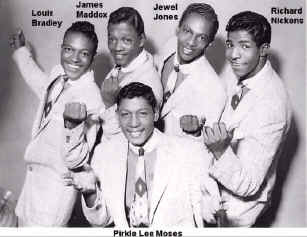 On December 26, 2000, the original El Dorados lead vocalist Pirkle Lee Moses, Jr. passed away.